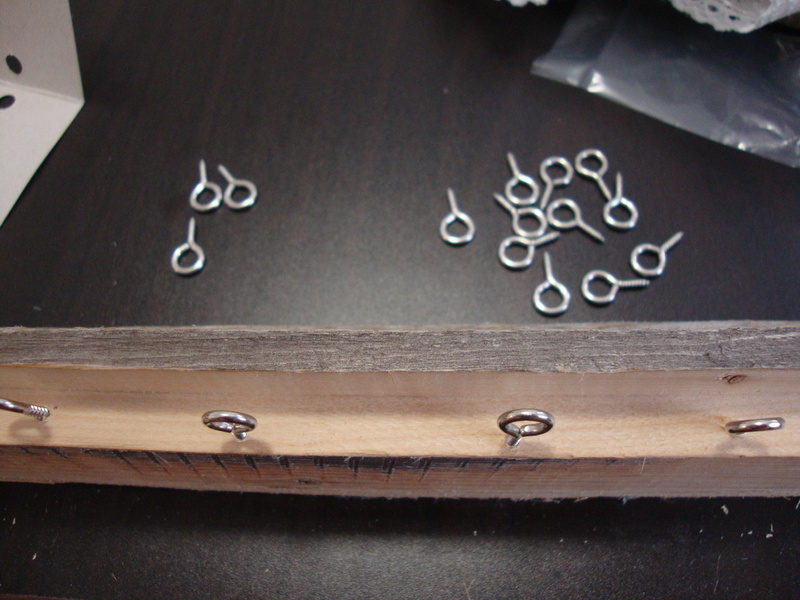 The best kinds of custom orders are the ones that give you a topic you could run with. 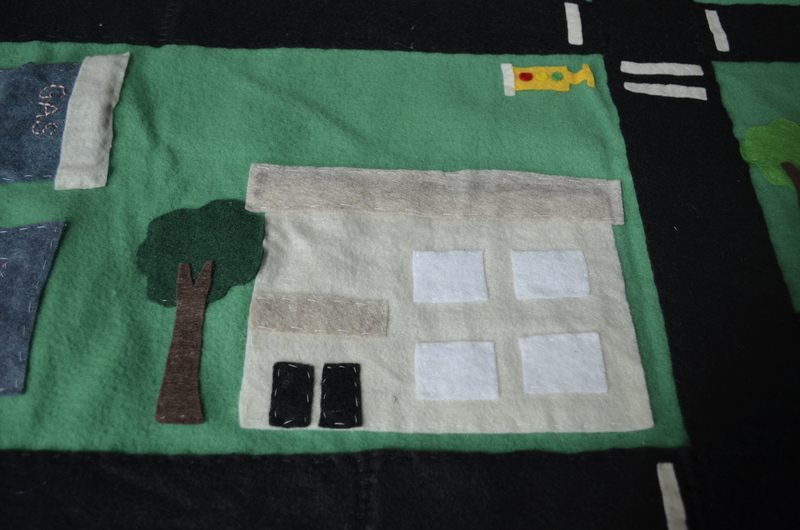 For this project, my friend asked if I could make something out of felt relating to Christmas and Dr. Who. 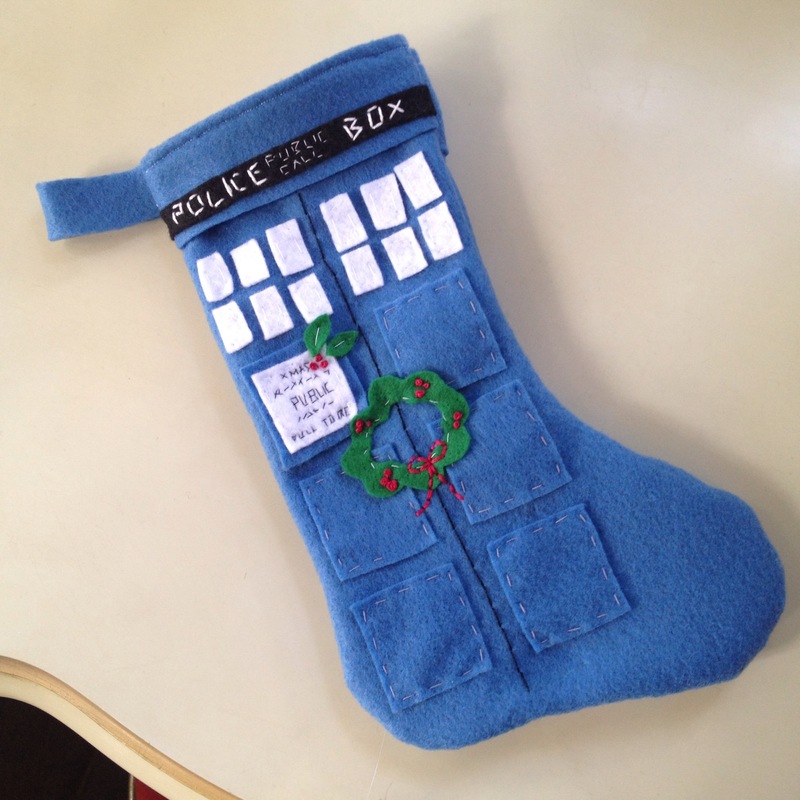 So my first thought – a Tardis Christmas stocking! 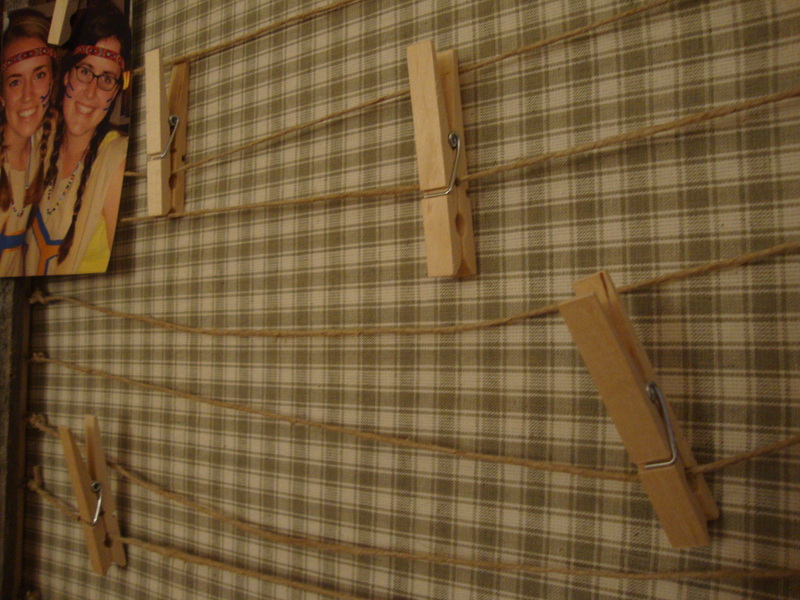 The idea was solidified by a picture I saw on Pinterest. (It’s so hard to have an original idea these days.) 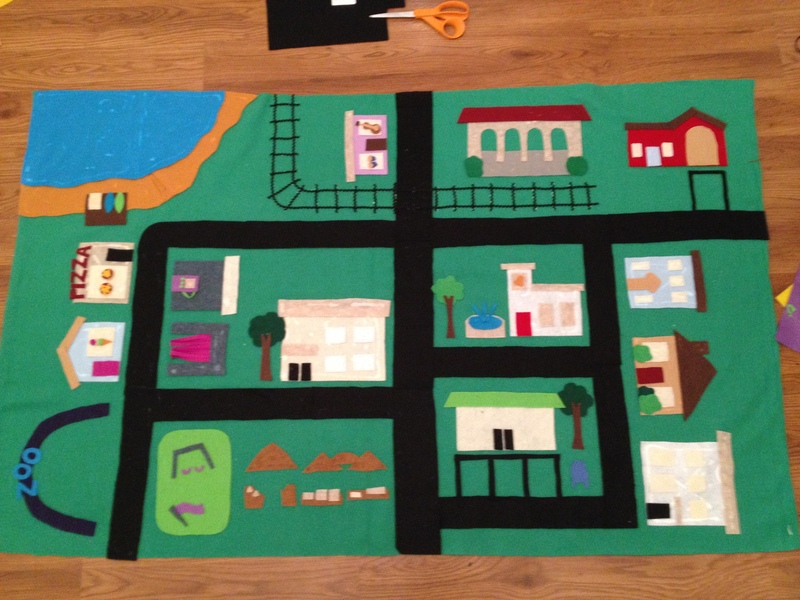 But in the picture, it looked like everything was glued down, and I decided to sew everything in place instead. Plus, I added the touch of holly and a wreath to add to the Christmas theme. It’s not a large stocking, but it’ll be perfect to hang at your desk, in a school locker or on a door handle. 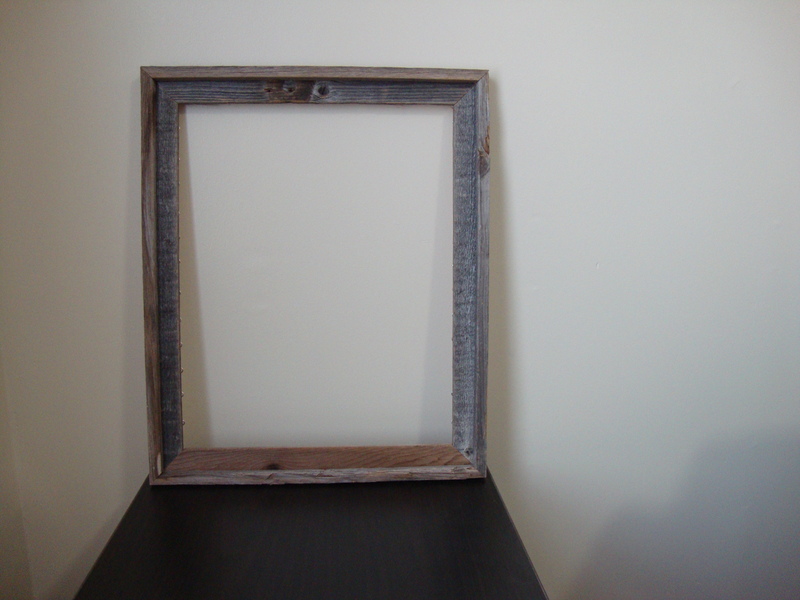 Send me a message via my contact page if you want to place a custom order for yourself! 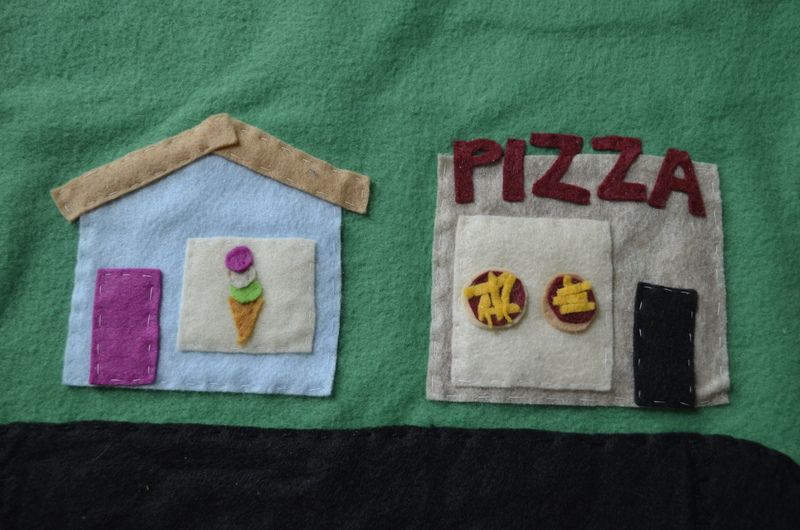 Slowly but surely, I am working on an inventory of felt food that will soon take over my Etsy shop. And while most nights I work to produce items I have made before, some nights I cannot stand the monotony and have to create something new. 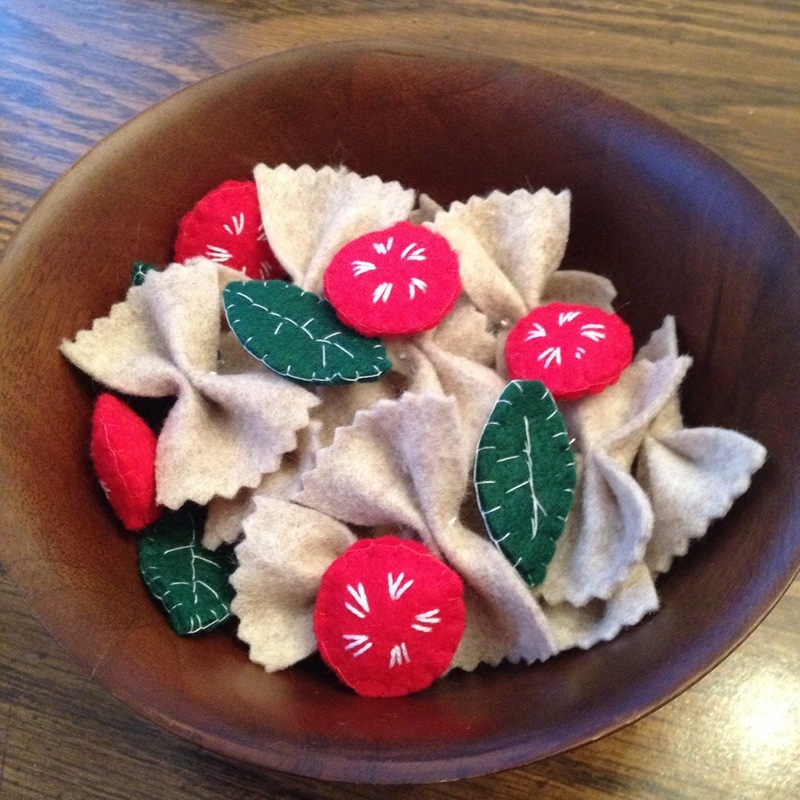 This weekend, I made some [felt] pasta, complete with bow-tie pasta, cherry tomatoes and basil leaves. 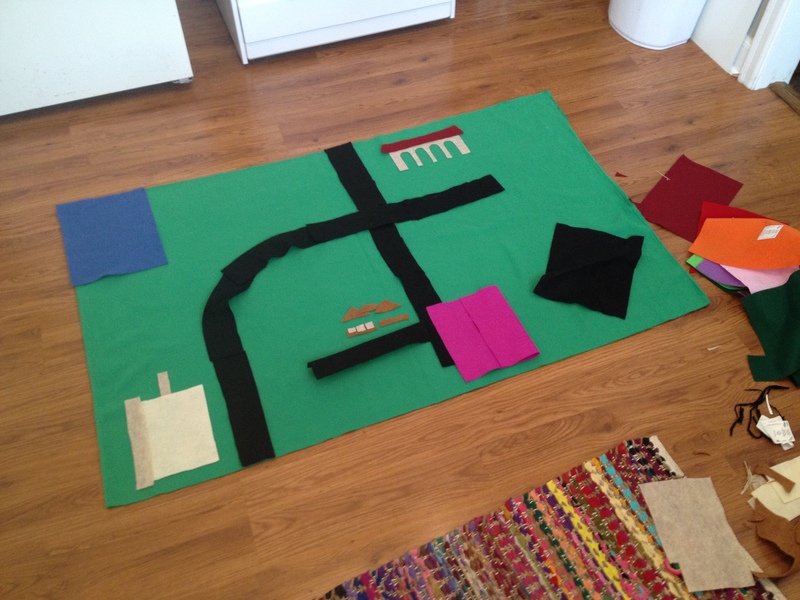 The brainstorming process for my nephew’s 2-year-old birthday present began about 2 months ago. 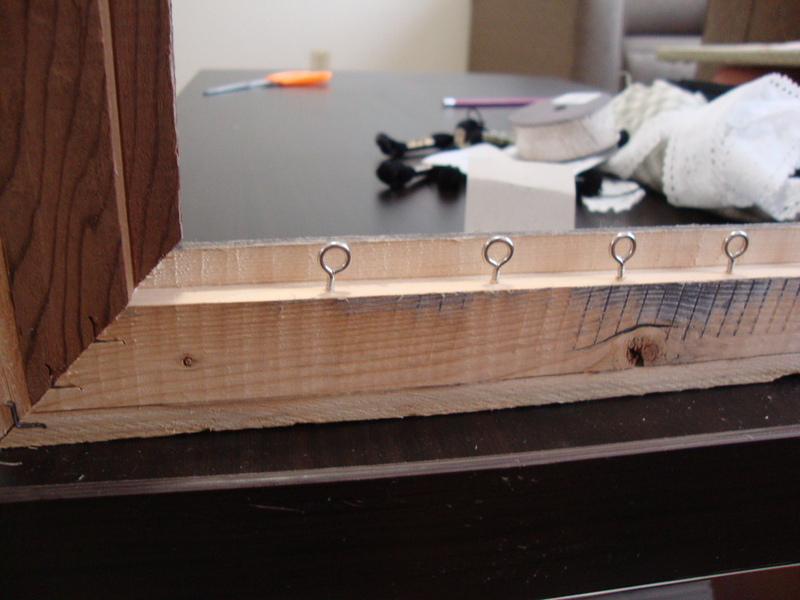 I had seen ideas for a “quiet book” on Pinterest. 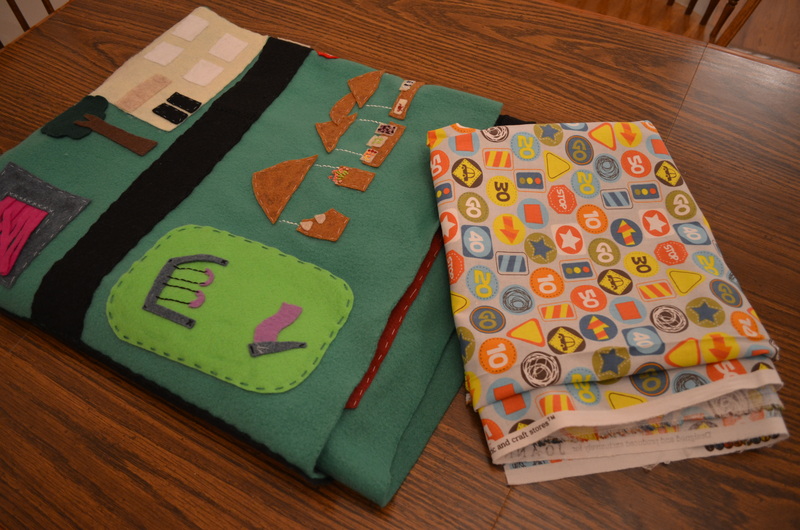 Mostly made from felt, “quiet books” are these cute flip books filled with little activities that are meant to entertain and keep your kid still and quiet. I liked the idea (especially since Josiah is quite the jet-setter), but I wanted something bigger! (He’s my only nephew to make things like this for!) 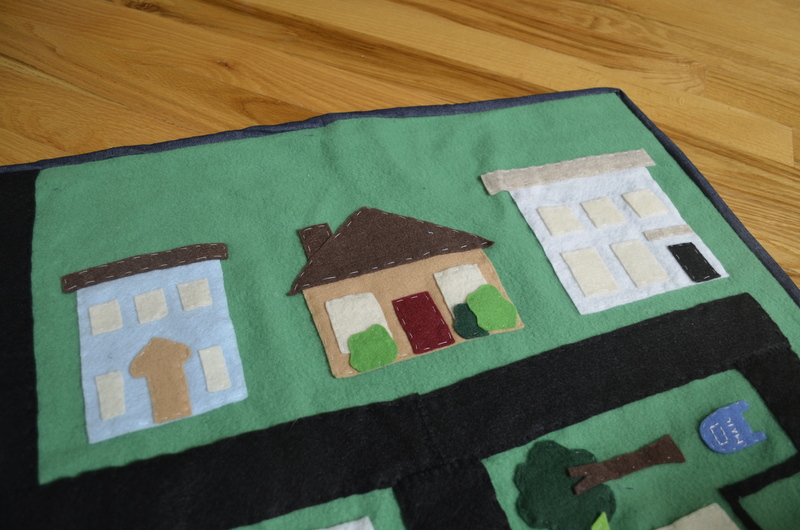 That is when I had the epiphany to create an awesome, felt play mat – customized for his life. I started by purchasing a yard of green fleece. 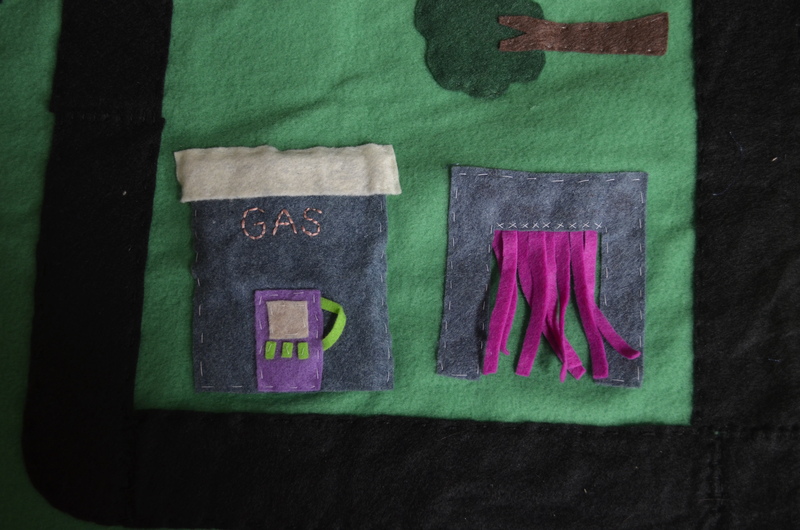 In my opinion, fleece holds up better over time than felt. 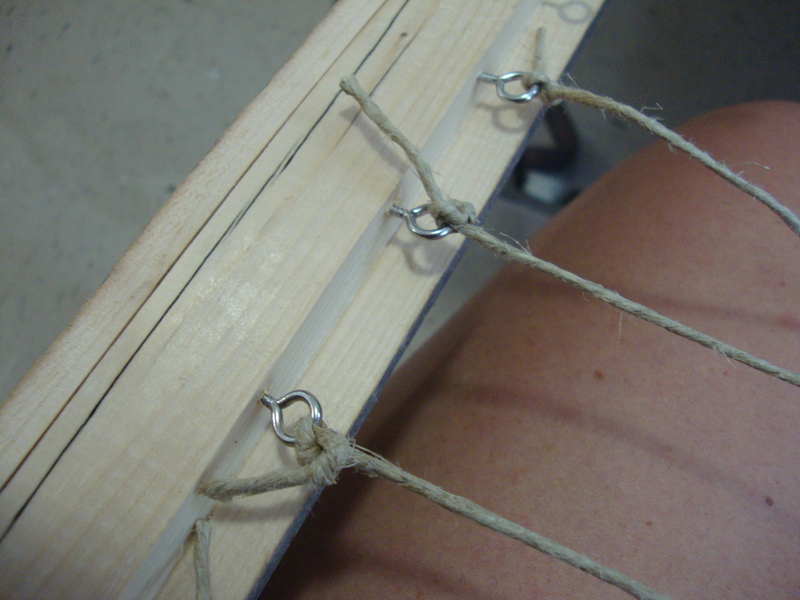 (Felt can shed and eventually start to ball up.) 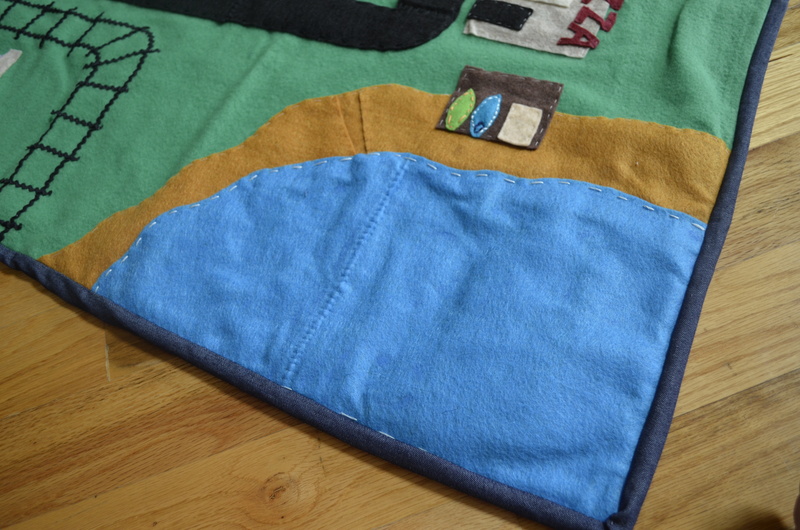 Though I planned to use felt for the details, I knew fleece would be a better foundation. 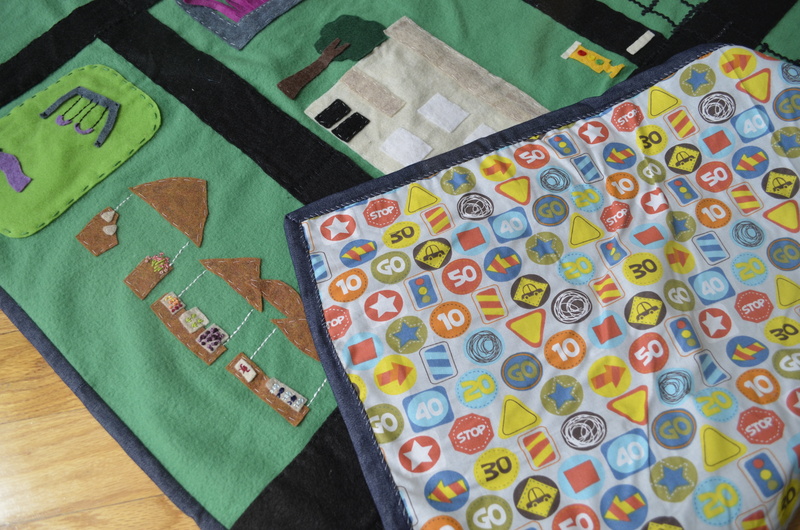 Plus, fleece is much softer in case my nephew every decides he wants to use the mat as a blanket. 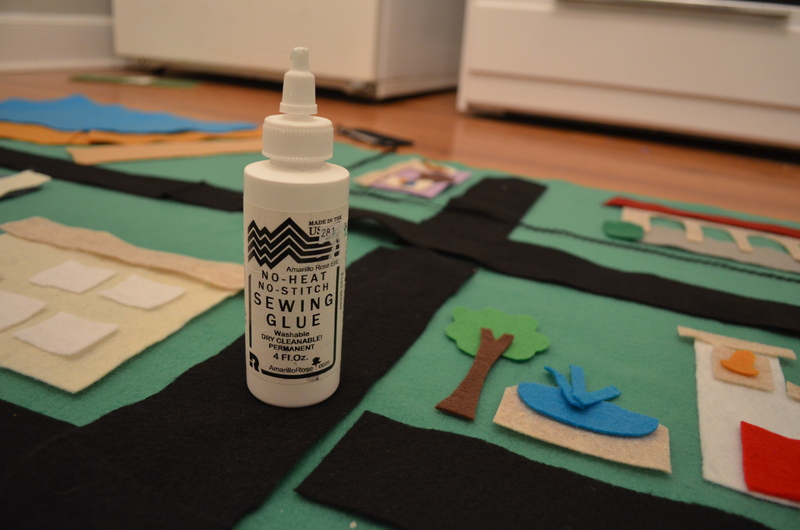 With everything cut out and in place, I used no-heat sewing glue to glue everything down. 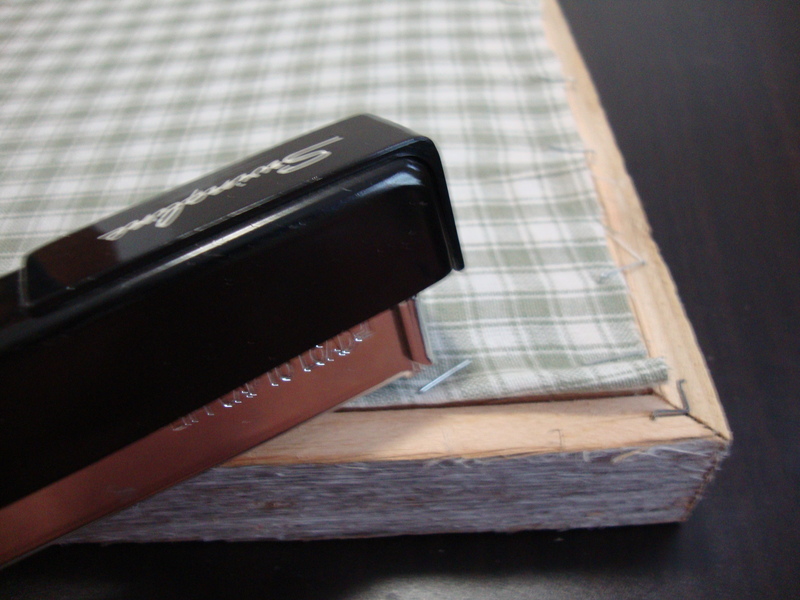 The glue left marks at first, but they go away as the glue dries. 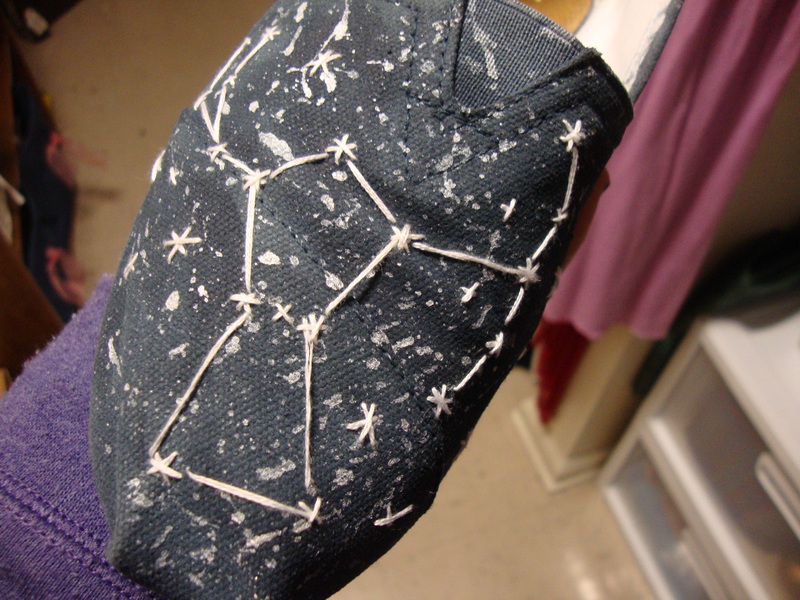 Despite everything being glued down, I wanted to secure the felt pieces in place by sewing everything down. (I am giving this to a 2 year old.) 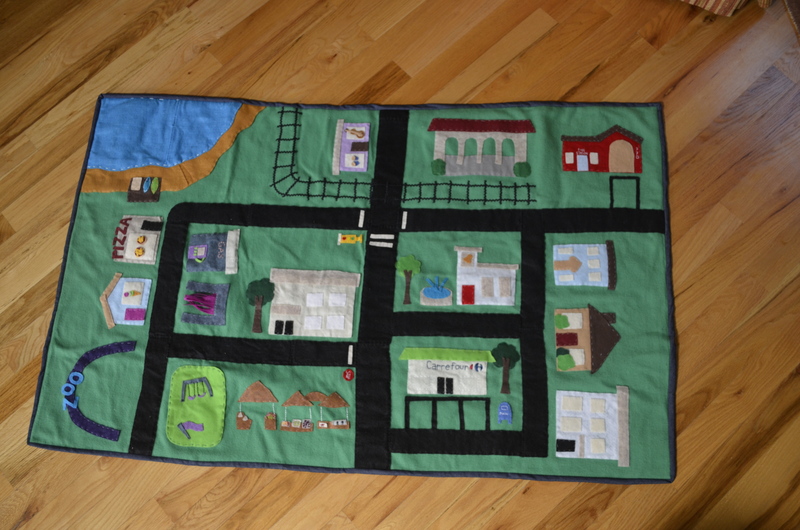 I used clear and white thread, and it took about a week to finish since I sewed everything by hand. 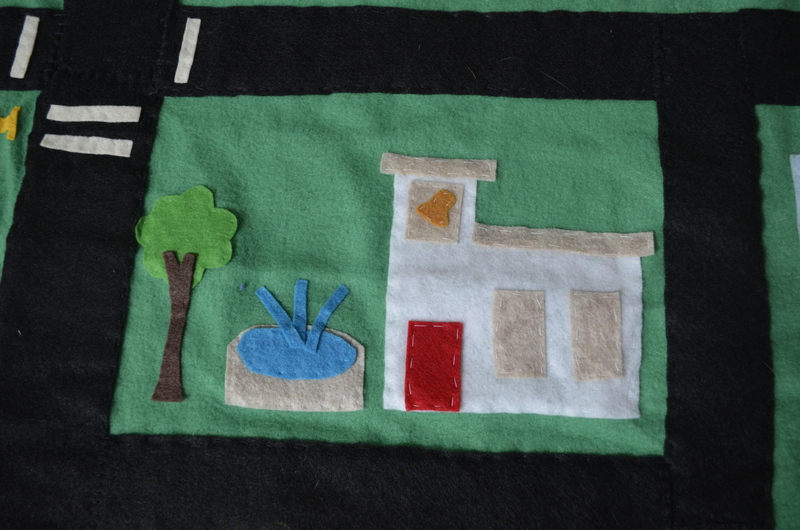 I also used embroidery floss to add a handful of details – like a sign for the gas station and items for sale at the market. 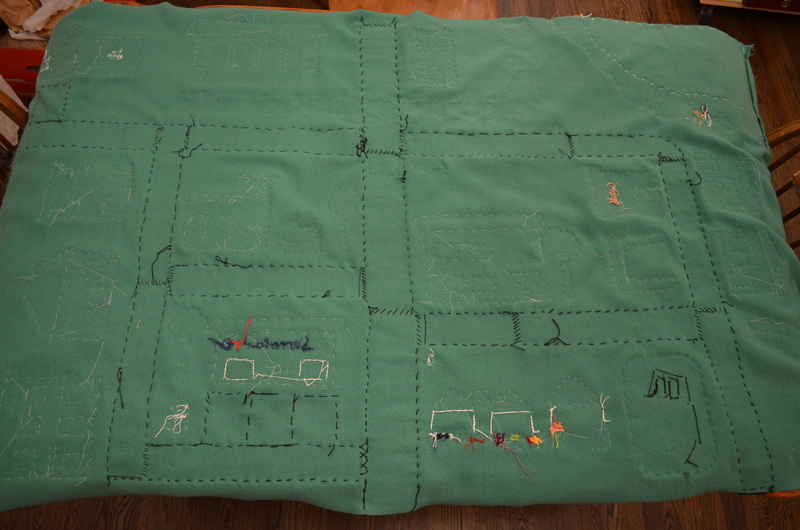 The back side of the fabric shows all of the work, but no one wants to see that. So I found this adorable fabric at Joann Fabric that I used as a back piece. 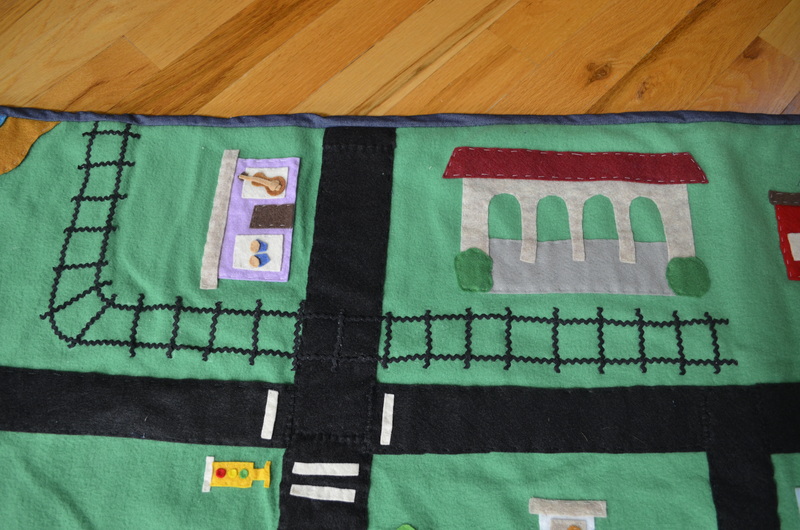 I customized this mat for Josiah, picking places that he would recognize from his everyday life. And from what I’m told, Jo loves some pizza and ice cream. Since they live right on the ocean, I added a beach with the surf club my brother belongs too. 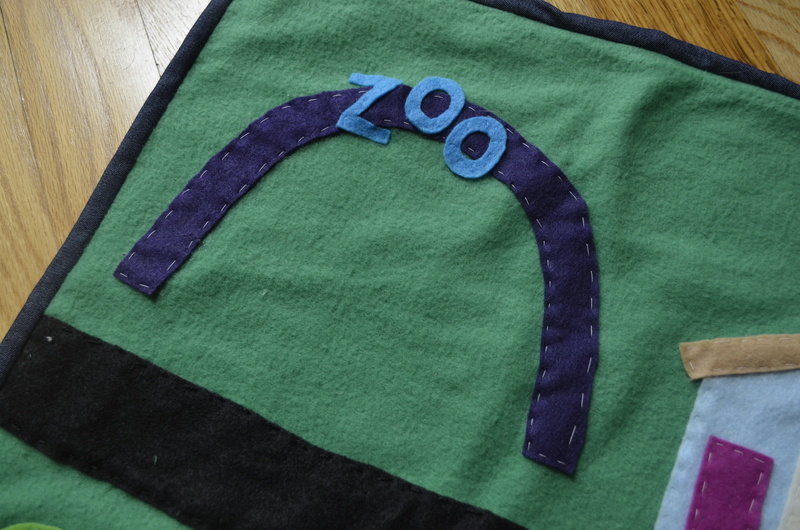 For the zoo, I decided to leave the space blank since Josiah has so many small, plush animals he could place there. I totally took this gas station/car wash idea from Pinterst. I’m obsessed with the car wash. It’s my favorite element on the whole mat! Dad’s office on the left, and a school on the right. 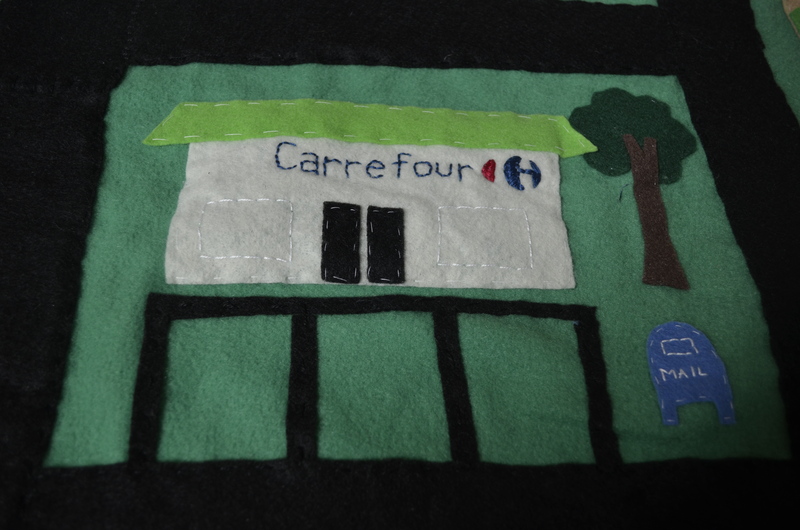 Their local grocery store is Carrefour. I tired to copy the store’s logo. Though looking back, I’m bet I subconsciously picked a green roof because I shop at Publix. And then with a little extra space, I placed a blue U.S. mail box! The train station was a must! 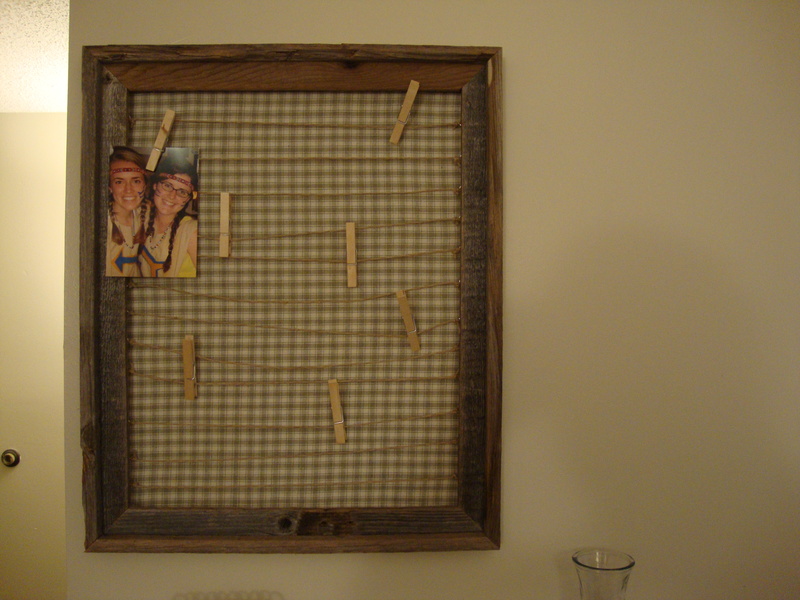 And this too is an idea I found on Pinterest. 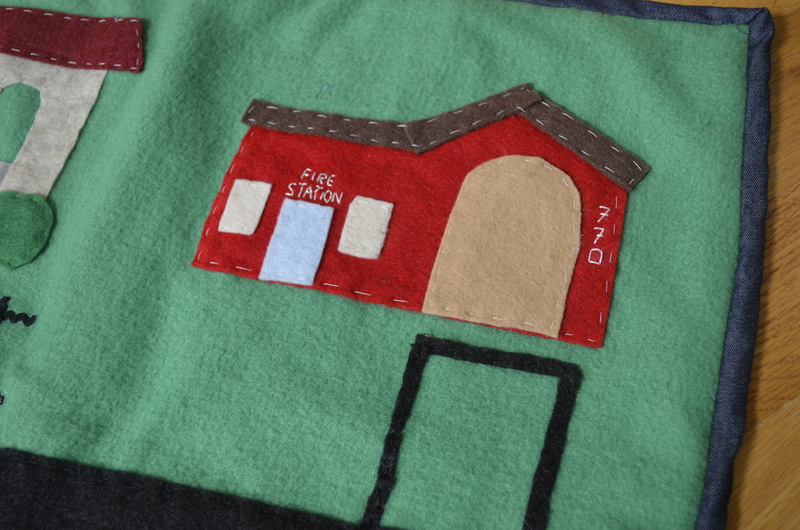 I cut rick rack into piece for the railroad tracks, and then used felt to create an accompanying train station. Last time I went to visit my brother and sister-in-law, we walked into the same music shop everytime we walked by it, so it was also a must-have. 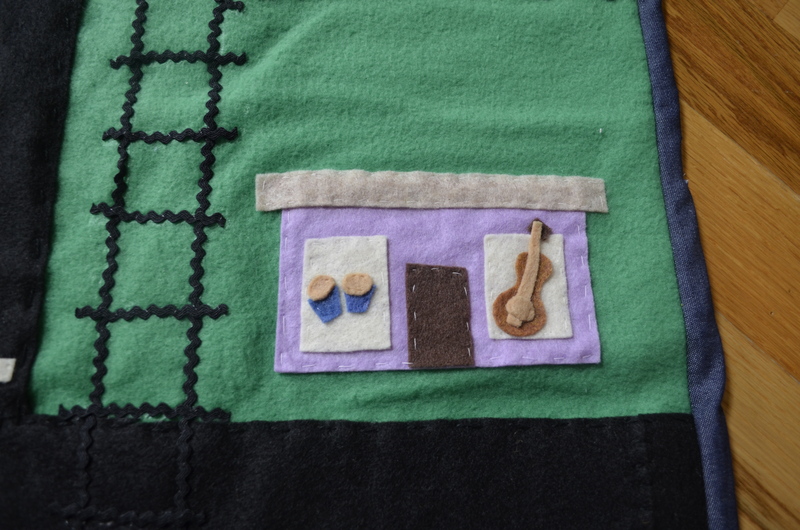 Plus, I think the little guitar and bongos look super cute in the windows. The fire station was added because I think it’s pretty iconic. Finally, I added a Medena, or a little market. Of course, this is a lot smaller than the ones Josiah goes too, but I thought it was a needed detail. 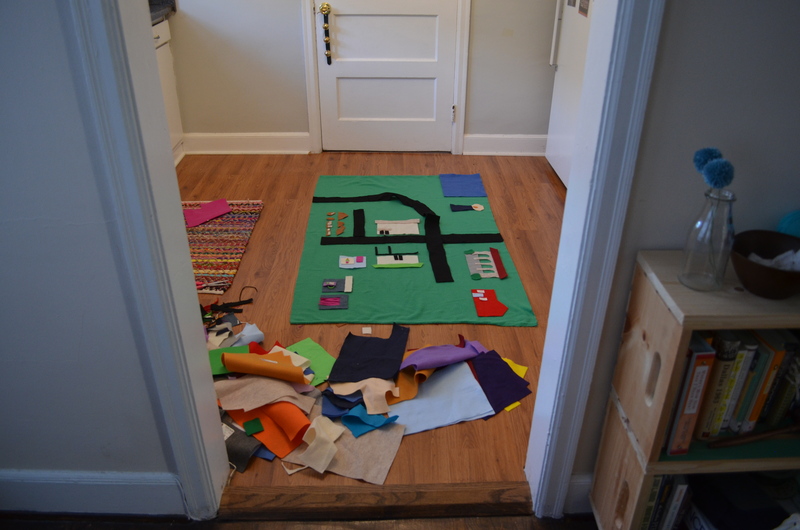 I attached the back piece of fabric the same as if I was making a quilt. 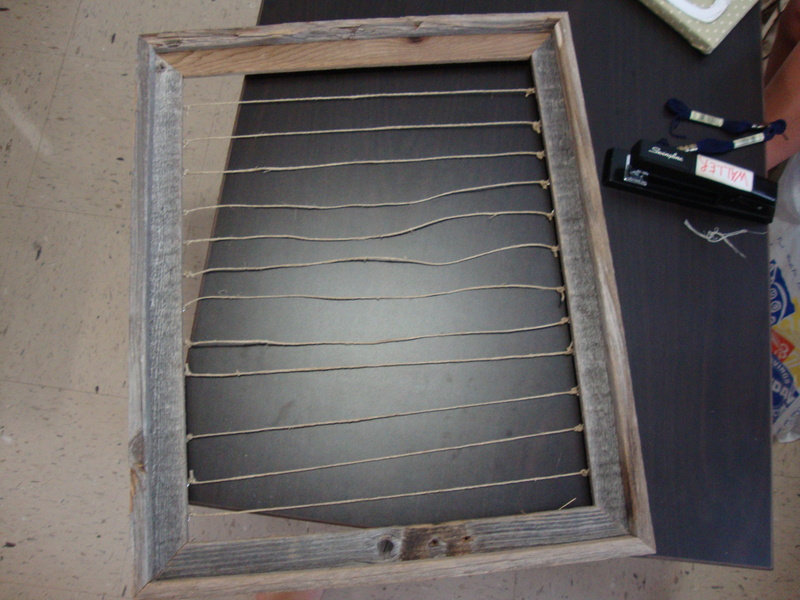 I used basting spray to attach the two pieces together, and then I used denim fabric cut into 2-inch wide strips to bind the edges. When my sister-in-law told me that my 19-month-old nephew loved to “cook,” I figured I could chip in a few ingredients. And while Ikea has supplied him with my the basic fruits and vegetables, I thought I would provide a whole meal: felt fried eggs, felt bacon and a stack of felt pancakes. The easiest of the 3 items is the felt fried eggs because you really can’t go wrong. 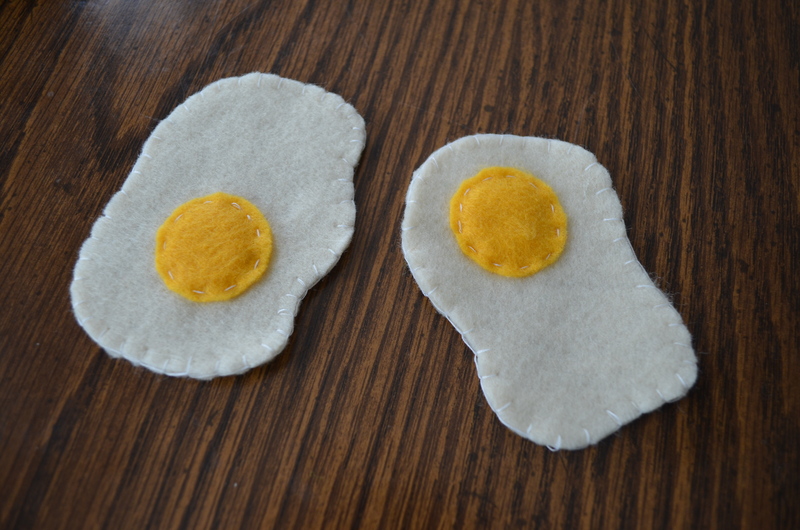 I used two pieces of the white felt (cut in any shape) and one circle of yellow felt for the yoke. 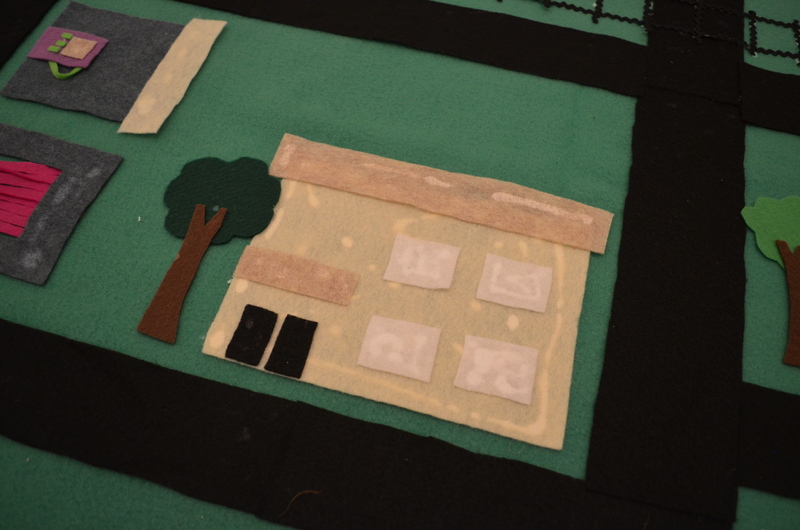 Once I attached the yoke to one piece of the white felt, I blanket stitched the two pieces of white felt together (using two pieces hides the back stitch from the attaching the yoke and it adds some thickness). I created the felt bacon strips next. 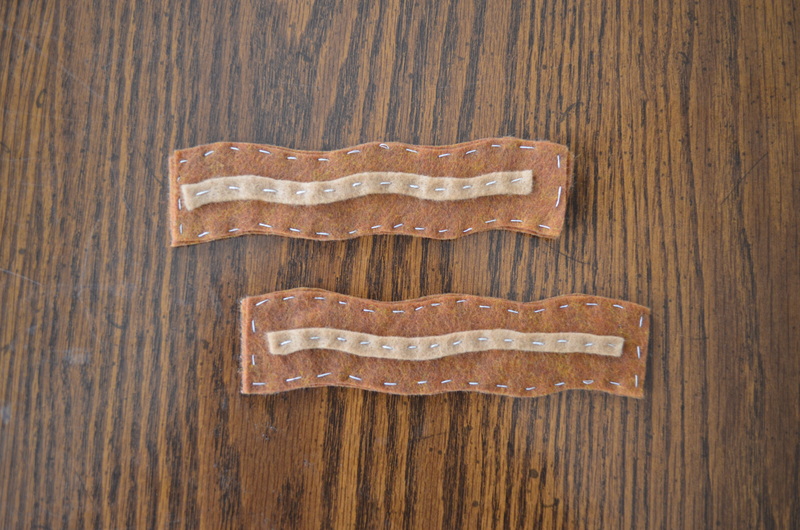 Again, using two pieces of brown felt to add thickness. 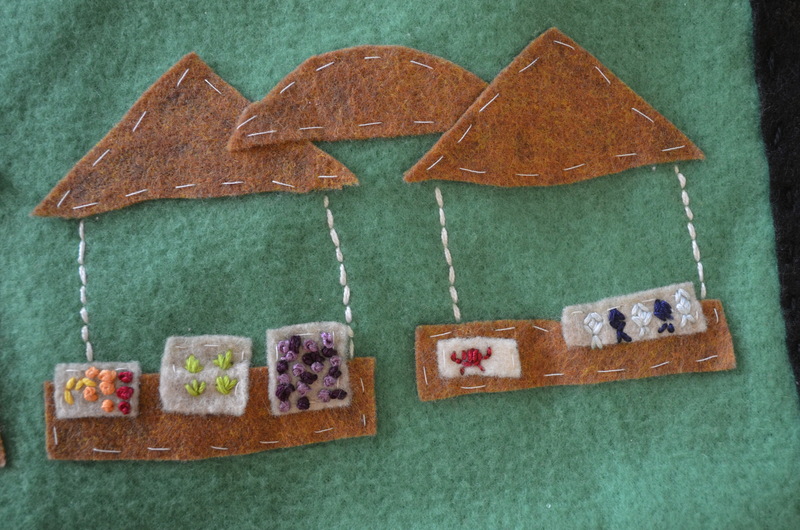 I added the line of “fat” using light brown felt. 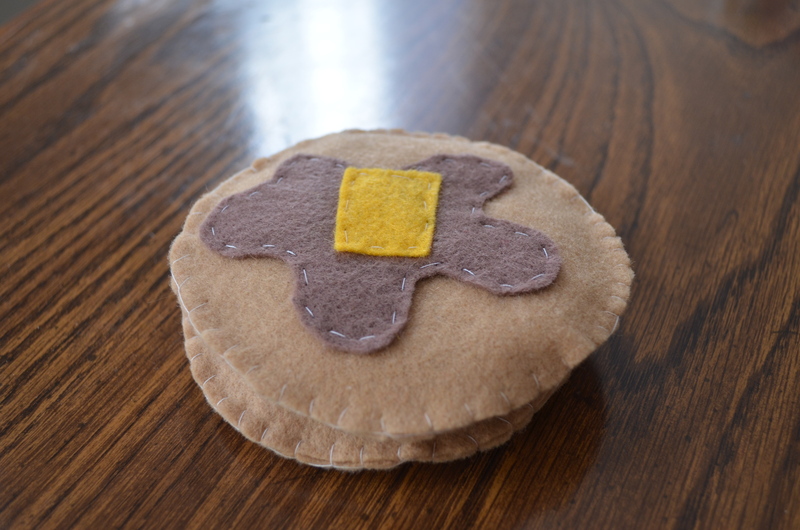 For the felt pancakes, I cut two circles of light brown felt as well as “syrup” with dark brown felt and “butter” with yellow felt. 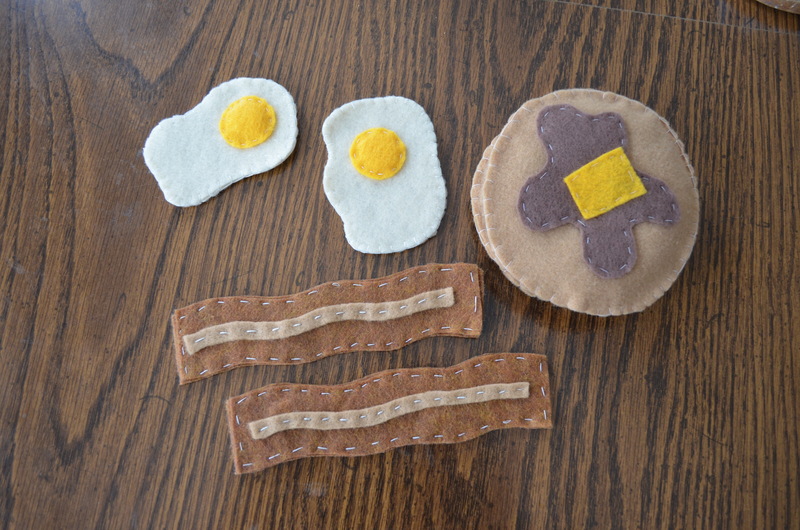 I attached the “syrup” and “butter” to one of the circles, and then using a blanket stitch, I attached the second circle, leaving a small hole to stuff the pancakes with batting before sewing it closed. 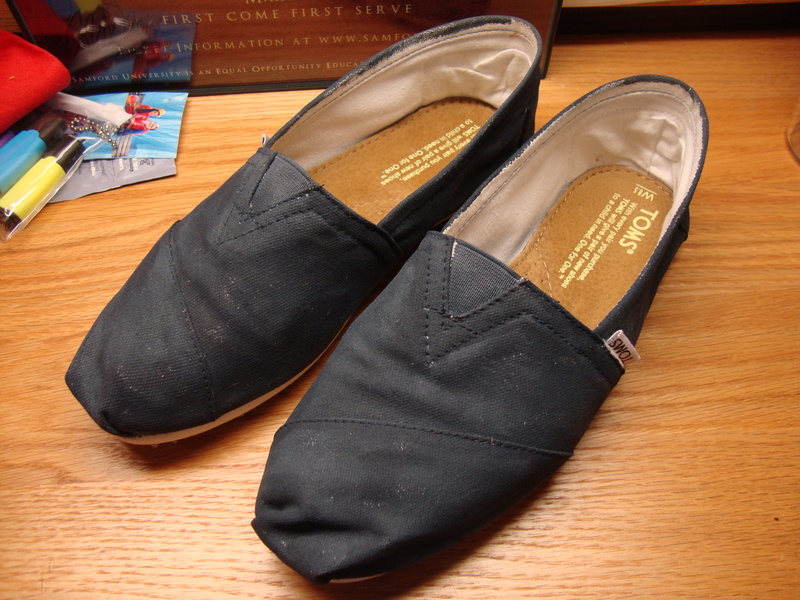 As a part of Spring Fling, SAC hosted a Toms Style Your Sole party. 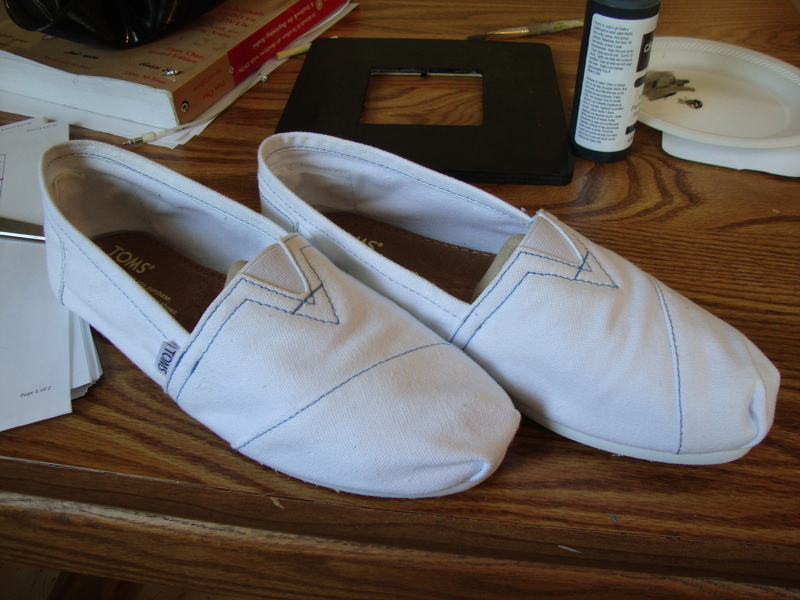 An event where people could pre-order a pair of white, canvas Toms, and then pick them up and decorate them on the night of the event. It was a huge success. 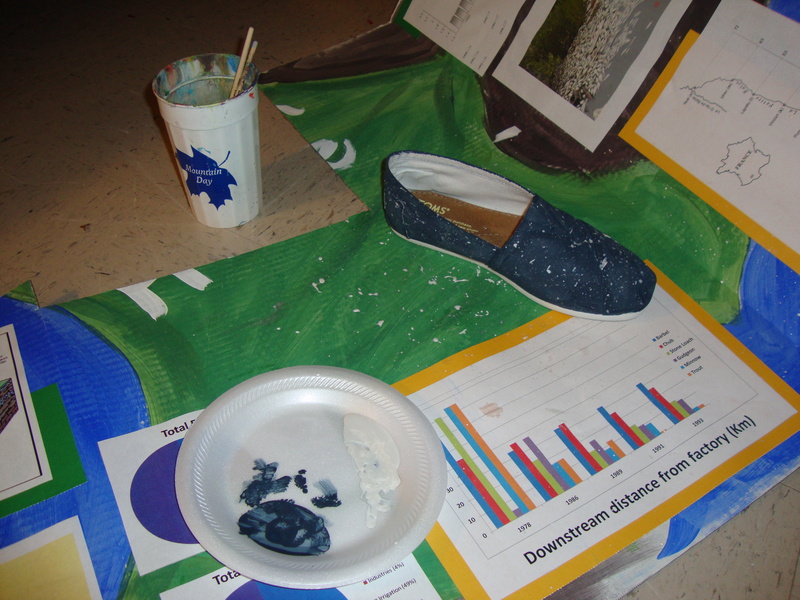 We sold 150 pairs of shoes, and on the night of the event, people were creating some pretty amazing, customized shoes. 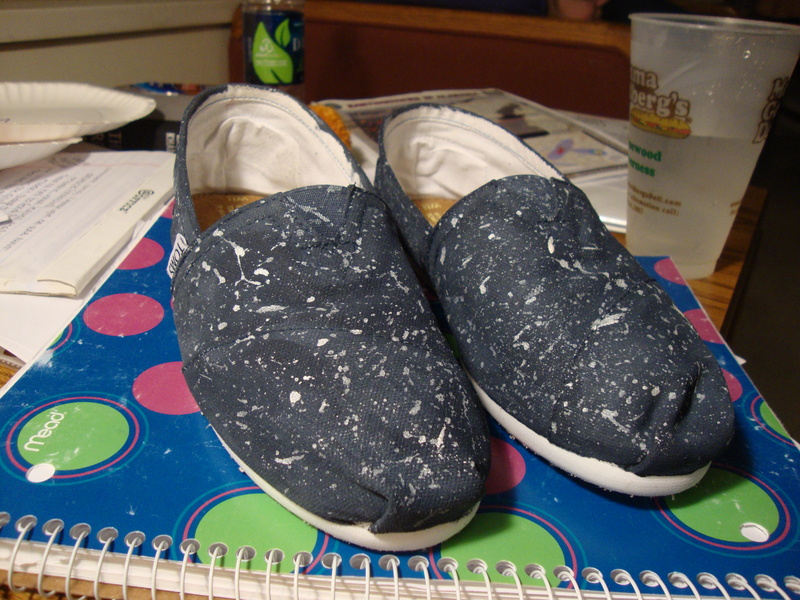 Of course, I ordered a pair, but being way too busy, I simply let them sit on my desk… until tonight. Ta da! 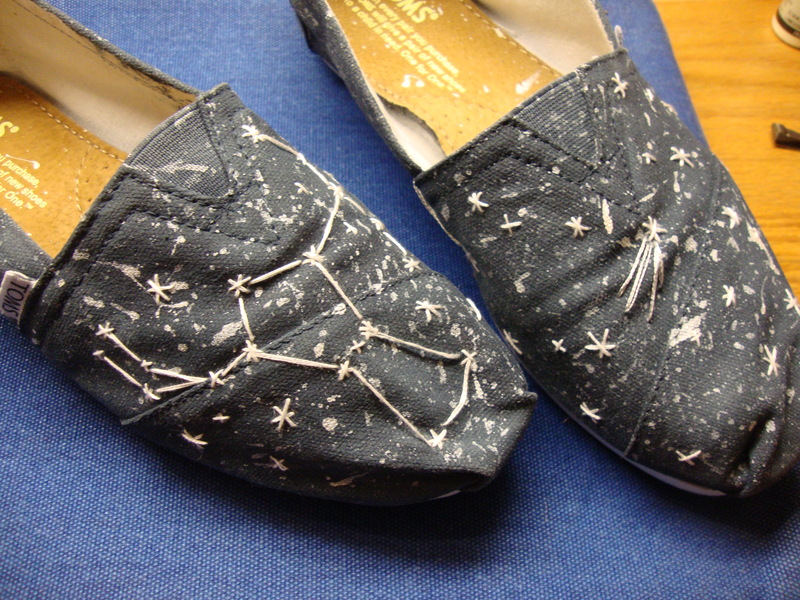 I feel like it would be no surprise that I chose a stars/constellation theme. And I am so excited in how they turned out. 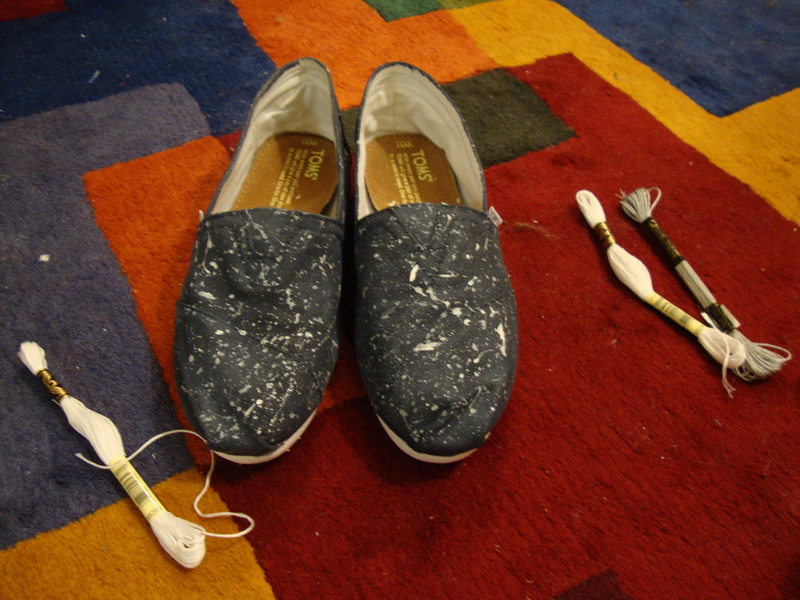 Step two – splatter paint. I used this to create the effect of the millions of stars that are out there in the universe. 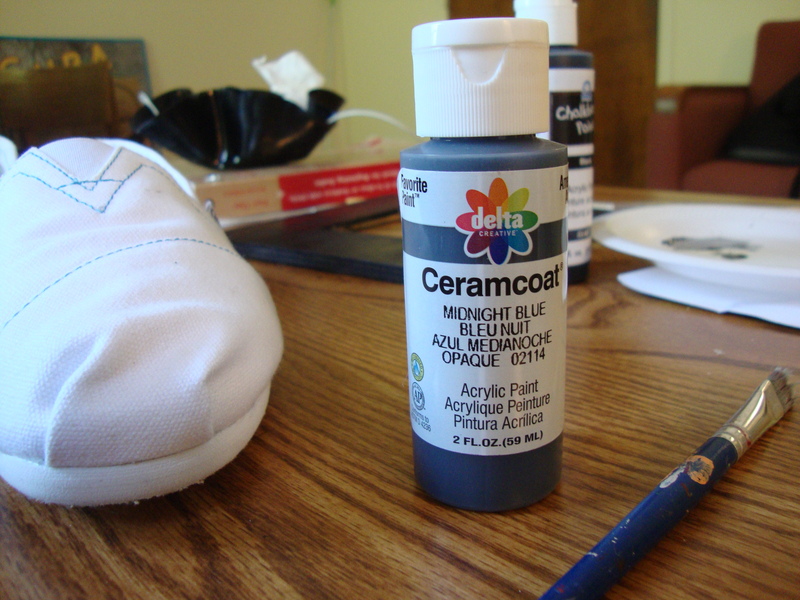 For the color, I chose a silver, metallic paint. 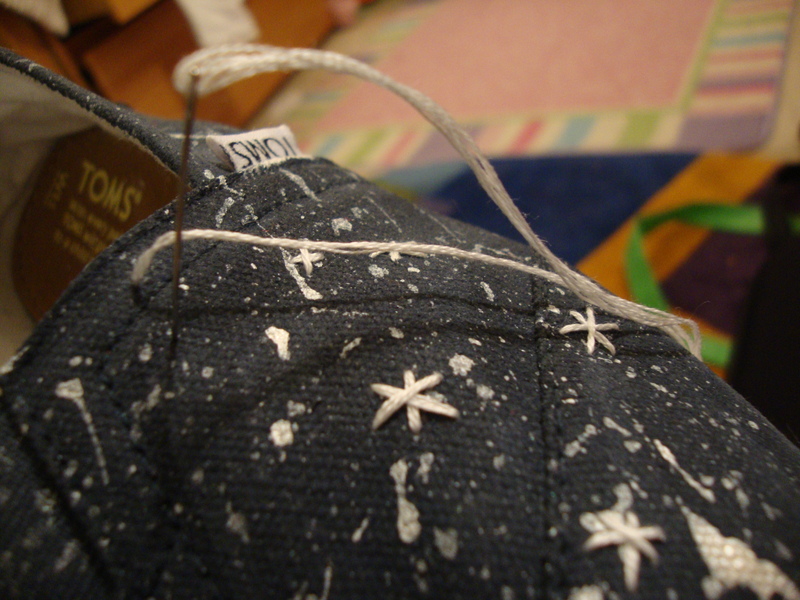 Step three – embroider the stars. 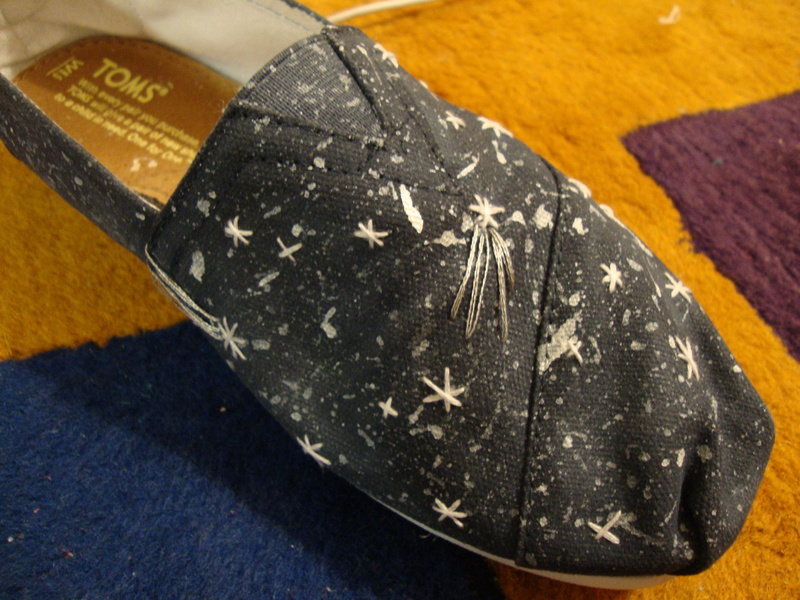 On the left shoe, I keep it simple by adding stars here and there (with a shooting star, of course). 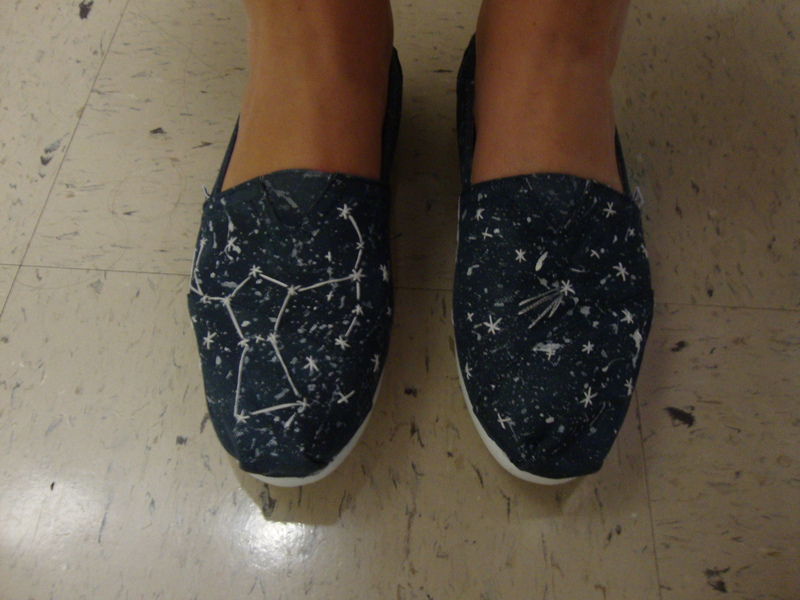 And then the right shoe highlighted the Orion constellation (one of my favorites). I am simply obsessed with them!